Lavender, botanically known as Lavandula angustifola, is a perennial aromatic herb that features tall spikelets of purple flowers. Gardeners prize lavender for its soothing fragrance, attractive blooms and pleasing foliage. Lavender can grow to 2 feet high, making it a striking backdrop for smaller plants. It also is effective in mass plantings or as an edging for walkways. To thrive, it prefers full, hot sun, good drainage and somewhat sandy soil. Lavender makes a good companion plant for many flowers and herbs. Lavender is a heat-tolerant plant that thrives in sunny and dry conditions. Take advantage of its Mediterranean growth requirements by planting it with rosemary, sage, basil, oregano, thyme and other herbs that prefer bright, hot conditions. Not only does lavender add welcome splashes of color to an herb garden, its fragrance offers a sweet complement to the other plants' pleasant herbal scents. Even when lavender is not in bloom, its compact, mounded foliage can provide an attractive backdrop to flowering plants, and there are many effective combinations. Viva Garden recommends planting lavender with echinacea. The nodding heads of the daisy-like echinacea create a pleasing combination with the sway of the lavender, and their flowers are in the same tonal family. Rudbeckia, or Black-eyed Susans, is another good choice to combine with lavender. It is hard to overstate the cheering effect of their bright gold-and-black flowers coupled with the purple of lavender. Cuphea, pentas and gerbera daisies also make worthy companions for lavender. 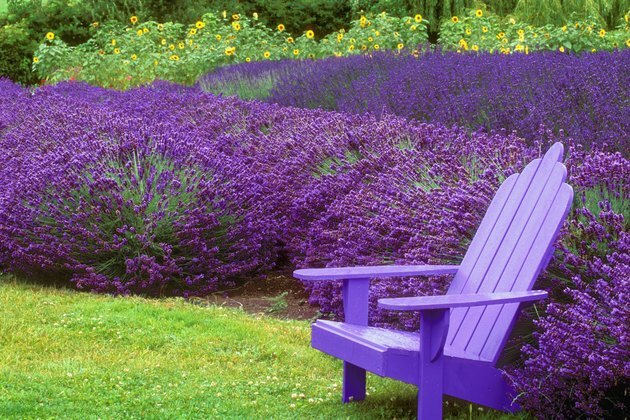 In addition to its other virtues, lavender acts as a pest repellent. Rex Research notes that it discourages mice, moths and ticks. Because of its protective qualities, lavender makes a good guardian plant for cabbages and cauliflowers. Consider edging a cabbage patch with this beneficial herb. In addition to deterring pests, lavender can lend beauty and whimsy to a vegetable garden, adding colorful contrast and dimension to the pale green heads of cabbage. There is no partnership like that of lavender and roses. Both have ravishingly romantic fragrances, and the spikes of lavender offer contrast to the intricate shapes of roses. Renee's Garden recommends inserting lavender plants between older rose bushes that are past their prime to function as eventual replacements. Lavender also can be used as a backdrop for a miniature rose planting. The Lavender Hidcote cultivar is particularly well suited to combine with roses. Spanish lavender, with its gray-green foliage and bright flowers, goes well with fiery orange and yellow roses. Is Mint Tea Good for an Upset Stomach?